Lasers play a vital role in everything from modern communications and connectivity to bio-medicine and manufacturing. 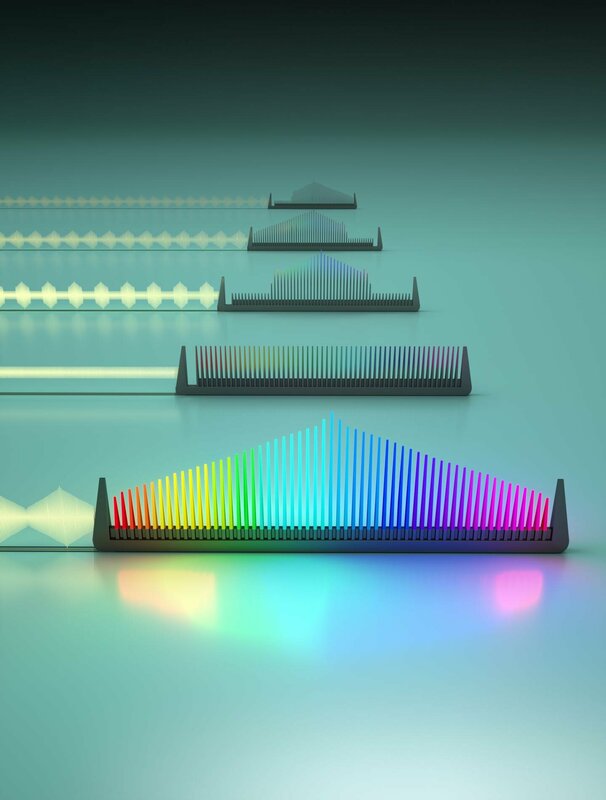 Many applications, however, require lasers that can emit multiple frequencies—colors of light—simultaneously, each precisely separated like the tooth on a comb. Optical frequency combs are used for environmental monitoring to detect the presence of molecules, such as toxins; in astronomy for searching for exoplanets; in precision metrology and timing. However, they have remained bulky and expensive, which limited their applications. So, researchers have started to explore how to miniaturize these sources of light and integrate them onto a chip to address a wider range of applications, including telecommunications, microwave synthesis and optical ranging. But so far, on-chip frequency combs have struggled with efficiency, stability and controllability. Now, researchers from the Harvard John A. Paulson School of Engineering and Applied Sciences (SEAS) and Stanford University have developed an integrated, on-chip frequency comb that is efficient, stable and highly controllable with microwaves. The research is published in Nature. "In optical communications, if you want to send more information through a small, fiber optic cable, you need to have different colors of light that can be controlled independently," said Marko Loncar, the Tiantsai Lin Professor of Electrical Engineering at SEAS and one of the senior authors of the study. "That means you either need a hundred separate lasers or one frequency comb. We have developed a frequency comb that is an elegant, energy-efficient and integrated way to solve this problem."